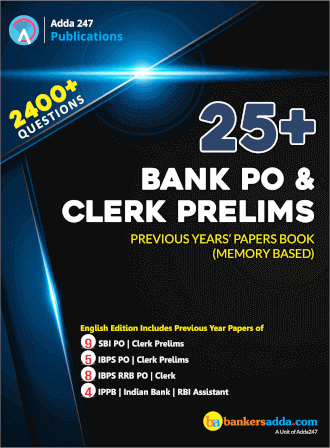 In this book, you will get Solved Papers of all major Banking sector recruitment exams like SBI PO, SBI Clerk, IBPS PO, IBPS Clerk, IBPS RRB PO and IBPS RRB Clerk. This book is replete with 2400+ questions with 100% solutions which will help the candidate in cracking any competitive exam with ease. Then practicing with previous years' papers can help you to get an idea of the difficulty level and types of questions asked in various Bank PO and Clerk exams. 9 SBI PO |Clerk Prelims. 5 IBPS PO | Clerk Prelims. 4 IPPB | Indian Bank | RBI Assistant Prelims.